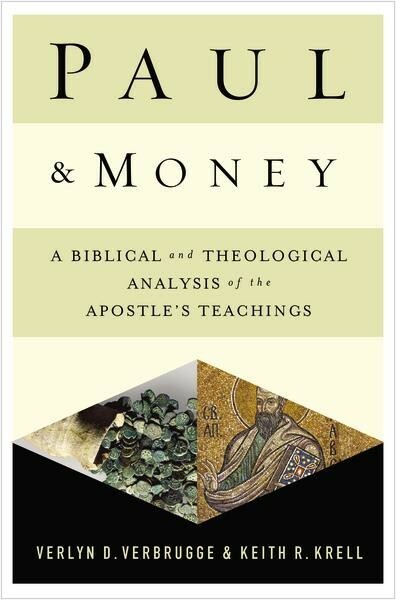 In the appropriately titled Paul & Money, Verlyn Verbrugge and Keith Krell have attempted a comprehensive theology of Paul and money. In other words, they aim to “probe everything that [Paul] says and does in the NT concerning the issue of money” (p23). It’s important to note that their study is not limited merely to the times Paul mentions the word money. Rather, the authors investigate whatever Paul has to say on “how the world of finance intersects with our lives” (p24). 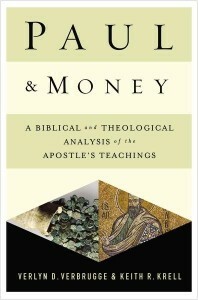 Given the broad and potentially overwhelming topic, Paul & Money is thankfully structured in a highly logical manner. The material is divided into three Parts. Firstly, Part 1 addresses Paul’s world, his teaching on financial support of ministers, and his own personal practices. Chapter 1 examines Paul’s views on financial support of Gospel workers such as elders (1 Timothy 5) and evangelists (1 Corinthians 9), and argues that his teaching is drawn from Jesus’ instructions to His own followers (e.g. Matt 10:1-15). However, what about Paul’s own reluctance to receive support? Chapter 2 seeks to understand Paul’s own motivation(s) for self-support, concluding that he consistently supported himself as a leatherworker when establishing new churches. In the case of the Philippians’ support-gift, however, he “did not view this as compensation for their having heard the gospel but as ‘fruit’” (p72). The difference here is that the Philippians were an established church freely joining in Paul’s mission. Chapter 3 addresses the issue of Patronage in the ancient world. Phoebe was a patroness to Paul (Rom 16:1-2) and Lydia had him lodge with her (Acts 16:14-15). In both instances, the exception was due to them being fellow believers by this point. Paul’s letters were not cheap to produce and perhaps Paul accepted support for these ventures or perhaps those involved in the production were believers who worked for free. Part 2 investigates an issue that appears often in Paul’s writings, but is often given little thought; namely, the collection for the Jerusalem church. Chapter 4 introduces poverty in the ancient world, the situation in Jerusalem, Paul’s concern for the poor and whether Galatians 2:10 indicates that the collection was an obligation. Chapter 5 investigates complimentary, and contradictory, proposals for Paul’s motives and theological foundations behind the collection. Was this purely charity? Was it a tax from Jerusalem? Was this an end-time fulfillment of the Gentiles bringing in their wealth to Jerusalem (e.g. Isa 60:5)? Was this an act of worship on the part of the Gentiles? Was this Paul’s attempt to heal division between the Jewish and Gentile believers? The authors argue that a combination of factors are in play. True to form, the Corinthian church had problems with the collection, and chapter 6 introduces these complications while chapter 7 investigates Paul’s theological response (2 Cor 8-9). Finally, chapter 8 ties up the loose ends by evaluating the success of his fund raising, the journey to Jerusalem, and his reception there. Part 3 covers the remaining and disparate material in Paul’s letters. The questions of freeloading and proper work-ethic raised by the Thessalonians (1 Thess 2:9; 4:11-12; 5:14; 2 Thess 3:6-15) are addressed in chapter 9. In chapter 10 the Corinthians show up again, this time in their socio-economic inequality when taking the Lord’s Supper (1 Cor 11:17-34). In chapter 11 we find Paul’s words regarding wealthy Christians (1 Tim 6:9-10, 17-19), false teachers (Titus 1:10-11; 2 Tim 3:12), the financial integrity of leaders (1 Tim 3; Titus 1), the support of widows (1 Tim 5:3-16), and meeting of believers’ needs. The controversial issues of taxes, debt and tithing are addressed in chapter 12. The authors conclude the book in chapter 13 with a summary and practical applications. The authors handle these topics with care and clarity, raising questions and pursuing them logically. For a wide-ranging topic, the authors’ arguments are easy to follow. The discussion is built upon the authors’ own respective PhD dissertations, and so draws from a deep well of research. However, recent scholarship is also engaged, keeping the work fresh. The areas in which Paul & Money will prove most useful are likely the in-depth word studies, the historical background, and engagement with recent scholarship. These all flesh out the topic and in areas where the layman may not have the time or ability to investigate independently and/or thoroughly. Some may be intimidated by the presence of untransliterated Greek, but context usually makes clear the word(s) under discussion. First, there were a few rabbit trails, such as Paul’s hermeneutics in using Deut 25:4 (p48-50), or several pages identifying the opponents in 2 Corinthians (p157-162), only to conclude that “[it] doesn’t matter for our purposes to identify precisely who these opponents are” (p162). Admittedly, some of what the opponents said was pertinent, but this did not require the space given. Second, and more concerning, were some comments on the Mosaic Law when discussing tithing. Saying that “the nitty-gritty, minute details of the law of Moses have no role in the life of a believer” (p271) requires unpacking. Was the OT tithe a “minute” detail? Which parts of the Law are “nitty-gritty” and “minute”, and who determines this? And why are “minute” details to be dismissed? And is it correct to say that any sections of Scripture “have no role in the life of a believer”? Assuming the best of the authors, this line is imprecise. Given that the quote is on one page and relatively minor to the total purpose of the book, this point should not discourage an interested reader. Paul & Money does what it says on the box. It provides a comprehensive survey of virtually everything Paul says about money and related topics. This work would benefit anyone who wants a big-picture look at Paul’s teaching. By pulling everything together in one place, it would also prove a useful resource when teaching on these topics, especially the subject of the Jerusalem collection. For those who want to have a Biblical foundation for their own attitudes and practices, this would also be very useful. I can heartily recommend Paul & Money to any interested party as a helpful resource that fills a unique role. Since we can’t escape money, the content of this study touches on everyone’s lives at some point, and is thus meaningful to anyone who wants to submit their financial lives to Scripture. Many thanks to Zondervan Academic for providing a review copy of this book.